The quality of grading is in its consistency, for which NGC and PCGS are renowned. On occasion, NGC and PCGS graders miss the mark by a point or so. Or make a judgment call if a coin is proof-like (PL) or deep mirror proof-like (DMPL). But the process of two graders with a finisher when the first two graders disagree is a fairly reliable system. We often hear that grading is “subjective.” Of course it is subjective to a degree (a point here and there) but not grossly so, as with some self-slabbers calling extra-fine cleaned coins MS66. I truly dislike that subjective label applied to grading, which suggests anything goes in assessing condition and that consistency is impossible to achieve. The result of that often is that sellers inflate value, claiming subjectivity, with buyers typically on the losing end, as this post later will document. Let’s return to the “grading is subjective” debate. In my younger days I was a reporter for United Press International. I covered a jailbreak by Peter Hochstein, C. Michael Anderson and Dan Sheppard. You can still find my article online. Later I learned how they broke out of their cells, although I cannot find my UPI story still online. This is how I remember it: Each prisoner positioned themselves in the cell and observed the jailer’s key unlocking the mechanism. Later they drew what they observed, put the drawings on top of each other, held up the drawings to light and, one day, surprisingly, they matched. Then the prisoners made the key to those dimensions in metal shop. And it worked. If there is a compelling reason, people see the world as it is rather than how they wish it to be. NGC and PCGS are excellent in this regard because the compelling reason is their reputations as world-class. Second-tier grading companies, ANACS and ICG, are also very consistent in grading, although not as rigorous as the aforementioned top-tier. The old PCI was somewhat on par with ACG (Accugrade) as third-tier. You wouldn’t know that looking at “buy” prices for old PCI-labeled coins on eBay. Sellers consistently cite PCGS prices for coins that just don’t measure up. What makes Coingrader Capsule on Coin Update special is that we don’t just share an opinion. We test it, which brings us to the topic at hand. 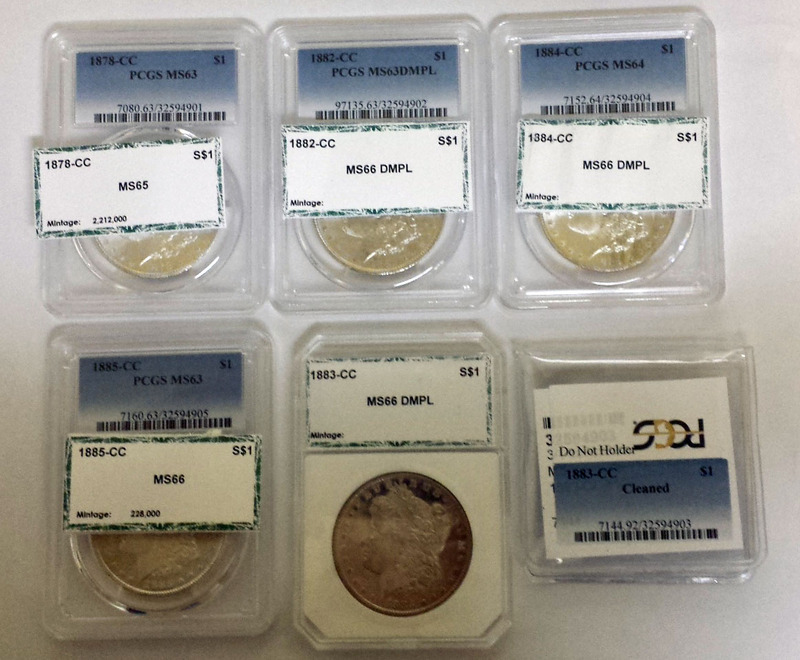 Typically, PCGS retail prices drop by as much as 40% in eBay and Proxibid auctions. (Check CoinFacts for recent auction prices.) As such, this grouping of Morgan dollars might bring about $1260. Both sides of a coin have to be deep mirror, which is why the 1882-CC lost the DMPL designation. But the biggest loss was what my elderly neighbor paid for the coins and what they are really worth, a loss of $13,500 on the high side and $14,340 on the low. Let this be a lesson to eBayers, both buyers and sellers. PCI-slabbed coins are just not crossover prospects financially. In fact, don’t go by the PCI grade; go by your knowledge of grading. What do YOU think? Have you bought older PCI green or gold labels and paid too much? too little? Have any crossed over to PCGS or, cracked out of the PCI holders, to NGC? I am a relative ‘new bee’ in regards to collecting slabbed coins. For the past 4 years, I have been submitting my coins to PCGS for grading. I selected PCGS because of their ‘then reputation’ of being the most discerning. Recently, I have been advised that PCGS has changed its slabbing method because coins could deteriorate within the older PCGS slabs. My question (s): How big a problem am I facing? My storage of the slabbed PCGS is limited to my somewhat damp basement gun safe. Does/Will it do any good to place my older PCGS coins within my older airtight USMC ammo boxes? Again, I enjoyed & learned something from your article. Semper Fi – Silky sends. Hi, Silky. “Semper Fi” (I have relatives and friends in the Marine Corps and respect their service so much.) PCGS is one of the top two grading companies, NGC being the other. And they both have excellent holders. Both companies often enhance their holders, typically to avoid counterfeit issues. Concerning PCGS slabs, I have never had a problem as you discuss (although I would certainly keep coins in an airtight container if the storage area is damp). And I always advise storage in a bank box for any collection worth $500 or more. Back to the PCGS slab. In my opinion, it had one serious flaw: the holder would chip if dropped. Sometimes PCGS coins chip while being sent in the mail. The new holder is said to avoid this problem. I’ve only had one case of a coin losing its luster in the many years I have been collecting. It was had a nice rainbow patina. But over the years the colors began to darken (indicating that the tone was artificial). And that was in an NGC slab. What I’m curious about are ANACS coins that were slabbed in the era when ANACS was actually an affiliate of the ANA before NGC became the ANA’s official grading service. Were they “first tier” back then? Should that be as substantial a pedigree as a PCGS “OGH”? Where does one draw the line between buying the coin vs. buying the holder? I never buy the holder, thanks to my knowledge of grading. I do check out holders of various companies looking for inconsistencies.